This episode was posted on 30 April completing the ten week run of 8th Doctor stories. On the whole, I consider the series to have been a success and I'm already plotting out a possible series 2 for the same time next year. I wanted a Moffatesque season finale. Having built up to the Dalek assault on the dream dimension I wanted to take the story in a completely different direction to find an unexpected way of resolving it. 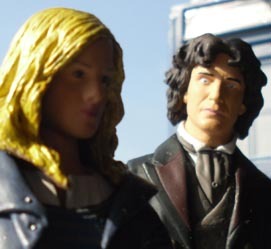 The original draft of the final episode took it even further with the Doctor arriving in a mystical setting, meeting odd characters that represented the various people Angel had met on her travels in the TARDIS. It would also have included flying dragons. Angel's subconscious self was represented by castle that the Doctor and his new friends would have to storm. 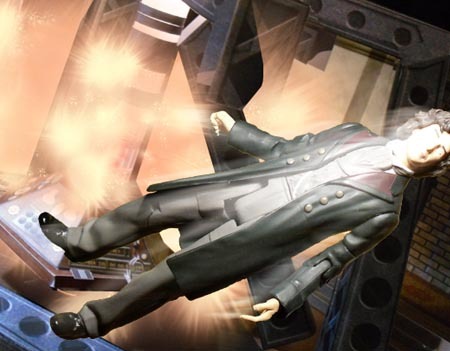 Only once inside would the Doctor realise he's inside Angel's mind, not in the dream dimension proper. Having virtually destroyed the TARDIS interior at the top of the episode, I toyed with the idea of the TARDIS reforming with the RTD era control room. This would basically wipe my previous 8th Doctor stories from history so I decided against it. For a long time, this episode was untitled. One title I considered was Out Of Your Mind but I thought this might give too much away. The idea of a fallen angel getting redemption was much more appropriate. 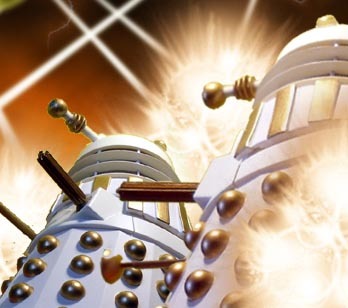 The Skaro scenes were shot on the 5th December 2010 at the same time as the other Skaro scenes for stories 1 and 4. The TARDIS scenes were shot backwards, beginning with the Doctor and Angel leaving in the TARDIS and ending with the TARDIS interior being destroyed. They were done on 7th January 2011. The Windsor street scenes were filmed weeks later. A pick up shot of the the Doctor and Angel in Angel's memory gallery was taken on 8th March 2011. At the same time a new ending was written and filmed. 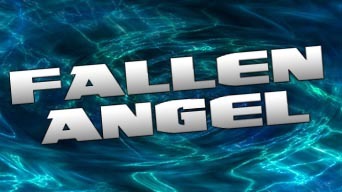 The images for this final episode were completed on 8th March 2011 with lettering following soon after. As with many stories in the season, more dialogue was added during the editing to flesh out the stories and character's motivations. That included a change to the ending. The original ending was set in the TARDIS and would see the Doctor and Angel ride off into the time vortex. This was changed partly to give a more emotive ending and partly to finish on a clean slate but still allowing Angel to return. Most of the images in Angel's memory gallery were taken from the opening episode of the series before Angel was a duplicate but some images were specially taken. 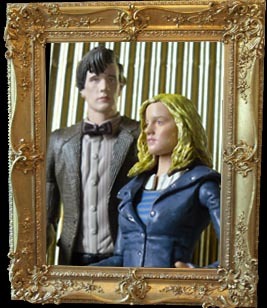 There's a hidden image of Angel standing next to the 11th Doctor. Red herring? Or a glimpse of something we've yet to see? Who knows (I certainly don't).